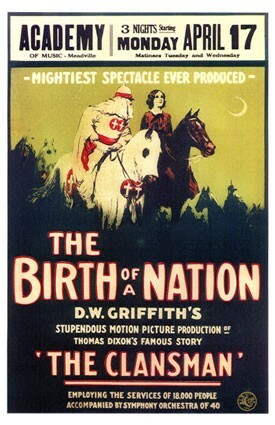 D.W. Griffith did much more than “write history with lightning,” as was reportedly said of his ﬁlm The Birth of a Nation soon before its release in 1915. Grifﬁth made history, and he did it deliberately and systematically, with more than a little help from Thomas Dixon, writer of the play and book (called The Clansman) on which the ﬁlm was based, and Woodrow Wilson, then president of the United States. Though Wilson could be said to be a silent, perhaps even unknowing, partner in the venture, together the three men turned the country upside-down (South to North) by making (or, in Wilson’s case, endorsing) one of the most celebrated, reviled and deeply racist feature ﬁlms ever made, a ﬁlm that espoused the “Lost Cause” history of the American South, which considered the South a victim of the Civil War and Reconstruction a tragic mistake. And they all did it with the best of intentions. The Birth of a Nation needs little introduction. This week marks one hundred years since its release. Though rarely seen these days outside of classrooms, it is by almost any measure the most famous ﬁlm ever made. Even now it stirs passionate debate and controversy wherever it is screened (or, often, is prevented from screening). Protests as late as the 1970s and early 1980s cancelled screenings in Los Angeles and San Francisco. Vandals so damaged San Francisco’s Richelieu Theatre, which was scheduled to screen the ﬁlm in 1980, that the theatre was forced to close its doors forever. The Directors Guild of America retired its D.W. Griffith Award for Lifetime Achievement in 1999 due to the 1915 ﬁlm’s volatile content. Despite Grifﬁth’s colossal achievements in ﬁlmmaking, it is the miserable racist ideology of The Birth of a Nation that will follow him to his grave. If that is also the legacy of Thomas Dixon, then, in his case, it’s a just one. Dixon was a “professional Southerner” and race baiter. Already famous well before 1915 for his many novels and plays (he wrote 22 novels), he was also an extremely popular preacher, lecturer and “scholar.” “In my work on the history of Reconstruction I have mastered the contents of more than 4,000 volumes forming the sources of history of that period,” he wrote in a letter to the Boston Globe (though he doesn’t name a single source). Dixon was a failed actor before he was a preacher, and a revival preacher before he was an author/lecturer. His bad-acting background served him well in casting his sermon spells, and he later adapted those skills to stoke the readers of his books in much the same melodramatic way. He was also a college pal of Woodrow Wilson. Grifﬁth’s legacy is a sadder case. His contribution to ﬁlm history is inestimable. The Birth of a Nation was the ﬁrst of its kind―some consider it the ﬁrst feature film―but Grifﬁth had already been revolutionizing the medium for several years. Alas, his decision to “correct” the extant history of the Civil War and Reconstruction is what left him his racist legacy. Wilson has, of course, been lauded for his post WWI efforts at attempting a world peace and his generally progressive, idealistic politics, but his own racist legacy is less well known. He segregated all federal ofﬁces during his presidency and considered segregation a beneﬁt rather than a humiliation for blacks. Born in Virginia, he was no more able to overcome his Southern sympathies than Dixon (born in North Carolina) or Grifﬁth (a Kentuckian). His ten-volume History of the American People (written from 1901 to 1918) endorsed the Ku Klux Klan as a savior of the South during Reconstruction, cast U.S. Southern history in the Lost Cause mode and considered racial mixing as an abomination. This from a man who had Ph.D.s in both history and political science. Though the ﬁlm would undoubtedly exist without the participation of Wilson, it was Wilson’s multi-volume book that furnished many of the “facts” on which the ﬁlm is based. The book is frequently quoted in the film’s intertitles. Both Grifﬁth and Dixon were consummate showmen, fully aware of their place on the cusp of not only popular culture but of history itself. One was a wildly popular novelist, playwright and friend of the President, and the other was the virtual inventor of a powerful new medium and well aware of what it could do. “It is the newest and most powerful form of dramatic expression and there is no end to which it can be carried,” Grifﬁth wrote in an article included in the publicity materials of the ﬁlm, an article that was reprinted in many newspapers of the time. Along with Wilson, these men were swept up in the great changes in the country and the world, and all saw themselves as players on the world’s stage. It was a perfect conﬂuence of forces, three powerful men with a chance to change the world, all at once, with a movie. Dixon was as well versed in suckering the public as Phineas T. Barnum himself. It was Dixon who cannily arranged the White House screening for his friend Wilson―possibly the ﬁrst ﬁlm ever screened at the White House. Well knowing that any publicity is good publicity, he was certain that, even if Wilson didn’t like the ﬁlm, that the White House screening could be a publicity gold mine. He was right. It was Wilson who is reported to have given the ﬁlm the stamp of ofﬁcial approval by saying that the ﬁlm was “history written with lightning, and my only regret is that it is all so true.” This quote, in fact, has never been successfully tracked back to Wilson. Indeed, Wilson later issued a disclaimer disavowing the statement, and it’s likely that Griffith himself cooked up the phrase. But no matter―one can’t un-say a statement once it’s in the public record, and the phrase will forever be attached to the ﬁlm. In any case, Wilson’s quotes adorning the ﬁlm’s intertitles act as a virtual endorsement anyway. One of the abiding ironies of The Birth of a Nation is that it was made by progressives in a progressive era. Grifﬁth, Dixon and Wilson all embodied the Progressive imperative in many ways―they all, for instance, strove to rid the world of social injustice through modern, scientiﬁc means. But all three had a twisted idea of injustice. Jacob Riis, a few years earlier, had already used the medium of photography to reveal the dreadful living conditions of the urban poor and, in 1915, motion pictures were still considered to be little more than an extension of still photography. Grifﬁth was using the new medium to accomplish much the same as Riis―reveal previously unknown conditions, lay bare the truth and propose a solution. As far as Southerners like Dixon and Grifﬁth were concerned, it was the North’s memory that needed reconstructing. They saw the North poisoned by industry, urban blight and miscegenation, and suggested that there had been a better way, a gentler way―the Southern way―but that this virtuous utopia had been destroyed by a gross misunderstanding, and it was time for the truth to be known by all. Grifﬁth told Lillian Gish, one of the stars of Birth, “I’m going to tell the truth about the War Between the States. It hasn’t been told accurately in history books.” Film as history and truth was his dream. It was historical moments like the release of Birth that pitted progressive against progressive, revealed the complications in the progressive discourse and made such labels so frequently misleading. WEB DuBois and the NAACP, champions of free speech, for instance, felt forced to try and shut down the ﬁlm wherever possible. DuBois wrote, “In combating this ﬁlm our Association was placed in a miserable dilemma. We had to ask liberals to oppose freedom of art and expression.” Meanwhile, racists like Grifﬁth and Dixon made offers of public debates and cash rewards to anyone who could debunk the ﬁlm’s “facts.” Few rose to the bait except in print, probably aware that engaging them would only fan the ﬂames of publicity and sell even more tickets. DuBois and Booker T. Washington had both been dealing with Dixon’s public racism for years by the time the ﬁlm was released, and had already confronted the question of whether ignoring him or confronting him would do the most good, or damage. Woodrow Wilson distanced himself from the ﬁlm when he realized the negative implications of its racist ideology for his political career and never mentioned it again in public. Grifﬁth and Dixon defended the ﬁlm to the end of their lives. Their shock at the negative reaction to the ﬁlm was as genuine as their naivete about both history and the overwhelming power of ﬁlm. Their version of “truth” was, as far as they were concerned, a positive contribution to the world, a progressive act to counteract the “lies” sold to us by politicians and war proﬁteers. They were terribly, miserably wrong but, certainly in Grifﬁth’s case, they were doing what they thought was right.